Perfecting this beer has become my white whale, my never ending quest for perfection. The problem is, I always mess something up or change too much. I still have sky high hopes for this batch, and it may still be the finalized recipe for this beer that I was hoping to find, but I made one error that I need to touch on before I get on with this: I used the wrong base malt! My LHBS sells a number of different base malts in bulk out of big containers. In my haste to get in and out in a reasonable time since I was running late on this brew day (Much like the post about it, this beer was brewed 09/20/15), I saw Canada Malting Pale Malt. In my rush to get my things together, I didn’t realize I got the Canada Malting Superior Pale malt, thinking instead I had their regular 2 Row. This malt is kilned slightly darker than your standard 2 Row. I had intended on just going with 2 row this time around, and getting that golden orange color from a half pound of light Caramalt. I now have a beer that is potentially darker than I intended. I say potentially because I was shooting for an SRM of about 5 to 5.5, now I’m around 6 to 6.3. I’m not even sure in reality I’d notice the difference, but I’m a beer perfectionist so things changing from the plan on brew day threw me off. This could still turn out exactly like I want it to though, so I’m trying not to get ahead of myself here and make changes that don’t need to be made. The Superior Pale is supposed to be a really nice base malt, so this could be a fortunate mistake and I may end up loving it. The other changes I made (Intentionally this time) to this batch from the prior ones is balancing the Citra and Mosaic more with the Columbus and Simcoe. The last batch was a bit harsher and resiny, and I wanted the fruity characteristics to come through more so I bumped the Cirtra and Mosaic additions up. I also used Warrior as my bittering hop. Columbus for bittering was just a touch harsher than I wanted in this beer. This is also the first batch of White Death to use Wyeast 1318 London Ale III rather than Conan. I came to this decision after doing my side by side yeast comparison of the two in an otherwise identical pale ale (Read about that here). 1318 is just awesome and I’ve used it a few times in lower OG beers. I can’t wait to try it in a DIPA. As has become typical for me, I had a higher chloride water profile to smooth out the mouthfeel for this beer. If you are reading this and haven’t read my other posts, I’ve been trying to chase the mouthfeel and body from guys like Hill Farmstead, The Alchemist, Trillium, Tree House, and Tired Hands. I think yeast selection and water profile are huge components to that. Really, I’m trying to make the quintessential Northeast DIPA here. A smooth mouthfeel, smooth bitterness, and a fruity juice like hop quality with a bit of earthy dankness to go with it. The brew day itself was the usual. Our neighbors came over to hang out for a while, so did my brother Kevin and his family. My wife came back from a Las Vegas trip just in time to help me mash in, so that was great! I hit my numbers on the dot. I cooled the beer to 180 for my 30 minute hopstand and then transferred it to the carboy. I dry hopped with the first dose right as fermentation slowed around day 5. I’l keg it in another day or so with the second round of dry hops and then get carbing! Kegging Update: I transferred this one into the keg over the weekend for the second round of dry hops. I do a closed transfer under C02 for all my beer, and for whatever reason I lost my siphon. I think the bottom of the cane may have gotten clogged with some trub, but even after clearing it and checking the dip tube and poppet on the out post of the keg that I was transferring the beer through, I couldn’t get the siphon started again. I was pissed! This is my favorite beer I make, and there was about a six pack or so left of beer still in the carboy. I was not going to waste it. I used my old autosiphon to put the beer in some glasses, cooled it down, and then used the neighbor’s sodastream to carb it up. I lost about another beer worth of foam, but at least I was able to drink most of it over the course of the evening. I also noticed the beer was a bit darker than I wanted, but not by much. I likely will go with plain 2 row next time, or cut or lower the caramalt. Still, the beer tasted awesome already. The FG came in at 1.013, giving me my 8% abv I shoot for with this beer. Appearance: As I had suspected, this beer turned out just the slightest bit darker orange than I’d prefer it be, but that’s pretty nitpicky of me. The color is still in the ballpark of what I was going for, and its still a pretty beer. It pours a nice orange color with a good white head. Smell: This beer smells fantastic. Very heavy on citrus and other fruity aromas such as orange, a bit or grapefruit, passion fruit, pineapple, and some subtle dankness. Some subtle yeast esters are under all the hops. Taste: This is great stuff! I love the London Ale III with this beer, I’ll be keeping it for sure. There’s a firm, but pretty smooth bitterness. When I brew this again, I may still dial the bittering charge back a bit more, but its still not harsh. The hop flavors follow the nose, lots of citrus and some tropical fruits. There’s a bit of sweetness that’s pleasing in the finish. Mouthfeel: Pretty much perfect for this beer. So smooth and silky. Nothing I’d change in this regard. Nice medium body on this, but it still finishes dry enough to be refreshing. This thing is chuggable for an 8% beer. Overall: This beer is 95% there. The last 5% is really just dialing in the details. I do think I’ll try regular 2 Row next time with just a bit of crystal to shoot for an SRM of about 5. I’ll dial the bittering charge back a bit, but the flavor and aroma hops are all spot on. This beer is so juicy in taste and feel, it just brings a smile to your face! The water profile seems to be right on as well. Wyeast 1318 London Ale III was fantastic in this brew, and I’m glad I went with it over Conan. I’m very confident the next time I brew this beer, it’ll be the finalized version barring any mistakes by me! 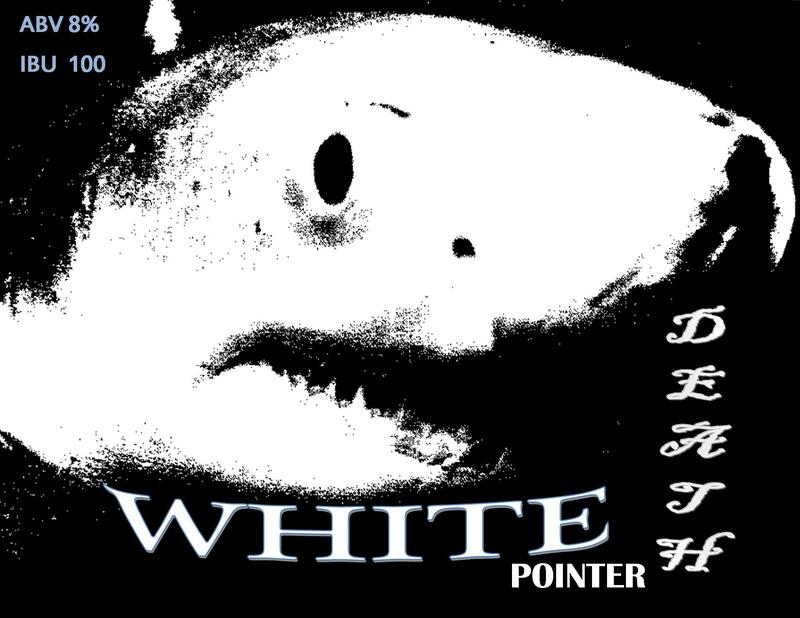 This entry was posted in Recipes and tagged 1318 yeast, DIPA, Hoppy, IPA, Juicy IPA, Northeast, Pale Ale by White Pointer Brewery. Bookmark the permalink. Hey Ryan thanks for reading! I’ve been fortunate to be able to try several beers from Bissell Brothers including Swish, and Foundation Epiphany. Both are truly amazing DIPA’s! Between those guys and some of the other Northeast guys like Trillium, Treehouse, The Alchemist, and Hill Farmstead, there are great hoppy beers coming out of that region. So for the latest batch of White Death, I took about five or six gallons of distilled water, and mixed that with my city tap water that I have a report for. The only things I add back in are gypsum and CaCl. I target Chloride to be somewhere around 200ppm, and sulfate to be 100 to 150. From what I understand, the higher chloride to sulfate ratio in the water is a contributing factor to the smoothness in the bitterness and mouthfeel that a lot of these Northeast IPAs have. I just typically add my salts to the mash. If my estimated Ph gets too low when I plug the numbers in my water spreadsheet then I’ll add some in the kettle instead, but its usually just the mash. This whole water thing has been largely trial and error for me. I don’t understand a ton about water treatment by any means, but what I’ve done here seems to work for this type of IPA. I hope that helps, if there’s anything else I can be more specific about then just let me know and I’ll be as detailed as I can! Cheers and thanks again for reading! Thanks. I have a feeling that my well water fluctuates a lot with how much rain/snow we get, so I am hesitant to even invest in a water report for it. Do you measure pH at all during/after the mash, or are you just relying on the spreadsheet estimation for the most part? I just rely on a spreadsheet estimate. I use the Brewers Friend Water Advanced Water Chemistry Calculator. I should get a ph meter at some point, its the only way to be sure, but I find the estimates get me pretty tasty beer and a ph meter is just one more expense so I haven’t bit the bullet on that yet. With my IPA’s and pale ales, I usually shoot for somewhere around 5.2 estimated mash ph. Gotcha. Thanks. Since it is a style that I really enjoy and can’t really buy commercial examples of on a consistent basis, I am determined to perfect my own Northeast IPA recipe in 2016. I am excited to dig and and really experiment with what makes this style unique. I will keep an eye out for your future versions. I’m in the same boat being in Illinois, pretty much impossible to find beers like this without trading for them. Like I said in the entry above, I’m going with regular 2 Row next time, and I’m making Citra and Mosaic the focus while subbing the Simcoe with Amarillo. The goal is to really get that juicy flavor and quality. 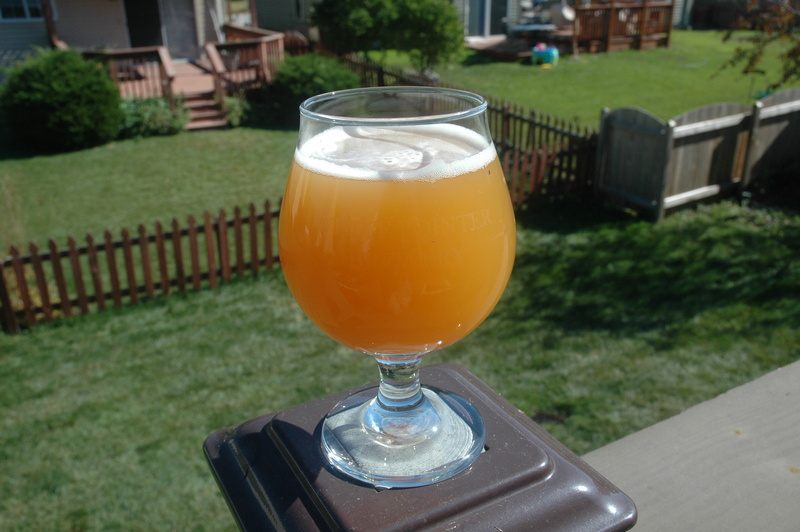 I’ve got another DIPA recipe I made that I want to try that fits the Northeast IPA category before I come back to this, but it wont be long before I get around to hopefully finalizing this thing! London Ale is also what a popular brewpub in CT is confirmed as using for their house strain. One of the first to pioneer juicy hop bombs like this. I’ve had good success with proper pitch rates. Did you try and harvest this yeast and if so, did it work for you? I have not harvested this yeast yet, though I plan on doing so at some point. I have read that others have had success doing so! For this particular beer, I’m not sure if the high hopping rates and OG would have an effect on harvesting the yeast.